This story is an updated and abridged version of my report, “The Cost & Sustainability of Bitcoin (August 2018 Edition)[i]”. The reader is asked to refer to the original paper for detailed references and deeper discussion. Future updates will come in this form, and include updates on methods and assumptions as new data emerges. Since my previous report demonstrated that “$/GH is king” due to low electricity prices amongst most large miners, the Antminer T15 will be taken as the proxy benchmark ASIC for this report. It should be noted that the co-released Antminer S15 is 12% more energy efficient than the T15, but 21% more expensive on a $/GH basis. Further to the above, the “GH/kg” Manufacturing metric comes in to play, as energy required for manufacturing & shipping ASICs is quite weight-centric. By the end of 2018, weight of material required to produce 1TH dropped 5%, from 300 grams (excl. PSU) to 285 (S9i was net 4.2kg, the T15 net 6.6kg). Using the S15 as a proxy, the ratio drops by 20%. It should be noted that this is the first model of this new generation of ASICs, and the kg/GH metric will improve as chips start getting optimised and overclocked. Based on the changed assumptions outlined above, the model has estimated the average cost to mine one bitcoin to be roughly $3,750. It should be noted that this research is an inductive, bottom-up estimate, with the intent to provide a ball-park estimate. 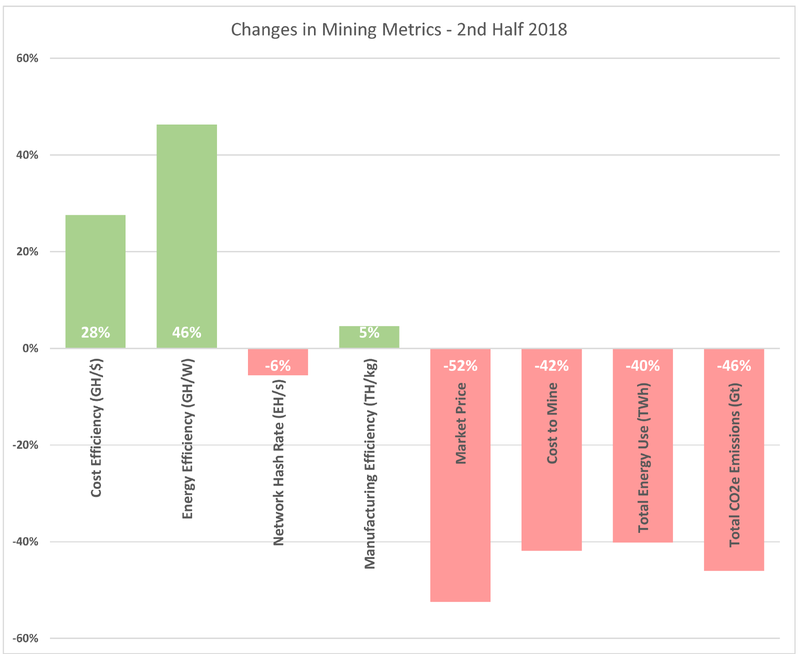 A sensitivity analysis has also been undertaken to demonstrate range of costs under different scenarios, which shows a realistic range of average mining cost of between $3,000 (driven by aggressive electricity price assumptions), and $4,000 (driven by hash rate increase assumptions). Due to the nature of competition in the Bitcoin mining market, costs that are significantly higher than the market price of Bitcoin can generally be ignored in the short term. Further, the model has estimated that the Bitcoin Mining Industry exhales 34 million tonnes of CO2 per year — about 0.06% of global greenhouse gas emissions[iii],[iv],[v] (37 Gt CO2 + 16.5 Gt CO2e). Of the 160,000 TWh of energy generated globally each year[vi], the Bitcoin Network chews through about 63 TWh/year (0.04%). It should be noted that all figures include the impact of the ASIC supply-chain, which represents over 50% of all emissions generated. [iii] The World Bank, “Total greenhouse gas emissions (kt of CO2 equivalent)”, https://data.worldbank.org/indicator/EN.ATM.GHGT.KT.CE?view=chart, (accessed 21 July 2017).